Everything we do is about improving the performance of each individual player. Alliance FC’s philosophy and programming start and end with player development. The philosophy of Alliance is to provide a program that promotes the development of high quality players to the next level, whether it is the Development Academy, or College Soccer. The Alliance has been true to their philosophy of enabling the growth of young soccer players and developing their skills both on and off the field. It is not about winning at the younger age groups. It is about the process of developing players for the next level. The Alliance is a culture created for the high-­‐level player, passionate about becoming a better soccer player. Every player is internally motivated to reach his or her ambition in the game of soccer. The Alliance philosophy is not just a way of developing each player on the field, but a way of preparing each player for every day life decisions. The Alliance player will develop life skills through creativity, hard work, humility, leadership and social skills. The Alliance looks for players that meet the player profile of the academy. A complete player must possess a high standard of technique, mental strength, physical superiority, and tactical knowledge of the game. Many players do not naturally possess all of these qualities, but should excel in at least two of them for initial selection. The Alliance is working to develop a player that is….. The Alliance is working to develop a player that has…..
A training behavior that is contagious. 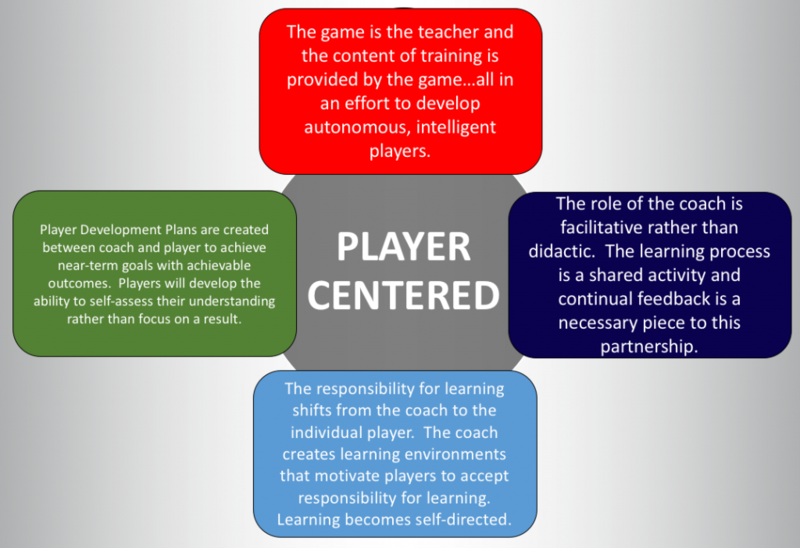 The teaching philosophy of Alliance is player-­‐centered. The coach will work hard to provide the players with the necessary tools and challenges to develop, and is responsible for creating a training environment that provides the content of the game. From there, our responsibility is to help our players learn to ask questions, be motivated to become students of the game, and ultimately to help them become problem solvers. Coaches should facilitate, ask questions and help educate the players’ minds in order to come to an agreement in situations of misunderstanding. Our belief is each player has the potential of being unique. The coach may demand moments of focus, proper technique, transition, and energy from the player, however, when it comes to decision making, the player is challenged with the idea of solving themselves. The goal of our philosophy is to develop a creative and intelligent player with a blue-­‐collar work ethic and mentality. The coach must understand the age group they are teaching, and learn to see through the player’s eyes. The coach must be patient and allow each player to make plays, good or bad, without penalty. This will give the player the belief he or she can continue to make plays as they see the game. An Alliance coach must believe in this philosophy and apply this philosophy every day, both in training environments and game environments. Alliance has a philosophy to develop a player from U15 to U19 under the 5 criteria: Technical, Tactical, Mental, Physical and Social. The philosophy used to achieve this is developed for the individual and for the team. Each player will undergo an extensive individual and collective development plan designed to create the best environment to reach his ambitions of playing at the next level. © 2018 by Alliance Sports Partners, LLC. All rights reserved.